- Material : MDF wood used as base. This clock is totally handiwork; it is a unique piece of handicraft. Available as per your required colour and design. You can use it in home or office and you can gift it also. We maufacture wooden clock, MDF clock, Hand Painted Clock Non Hand Painted Clock, Paper paste clock, Name on clock, Logo On clock, Brand Name Onclock, Birthady gift clock, Return gift clock, wedding gift clock, Antique clock, alarma clock, corporates gifts clock. This thoughtfully designed wall clock is sophisticated and opulent. It has a graceful feel of Saura art with classy aesthetics. Saura art works are conspicuous for their elegance, charm, aesthetic and ritualistic association. These pictograms depict the literature and philosophy of one of the ancient tribes of India, Saura tribals. Wall clock in steel finish. Name of Bride and groom can be printed. - Offered in various shapes and designs. 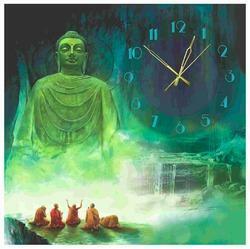 As a recognized name in the industry, we are offering an exclusive Art Wall Clock. - The clock is laser cut from Matte/Glossy black/white acrylic 3 mm thick. 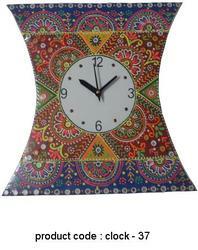 This beautiful clock is a perfect reflection of Indian art. The timepiece is beautifully crafted in wood , decorated with hand made painting and artistic carving , finished with a subtle brown and white color. Ideal as a gift! Being a reputed name, we are offering Abstract Clock to our esteemed clients. Customers can source these clocks at reasonable rates and in bulk quantities. Offered clock requires minimal maintenance. - Great for offices and hotels.